On Thursday 23rd August we had over 200 staff and students travel to Bunbury to participated in the 2018 South West Year 7 & 8 Lightning Carnival held at Hay Park, Forrest Park, South West Sports Centre, Eaton Recreation Centre and Bunbury Indoor Volleyball. 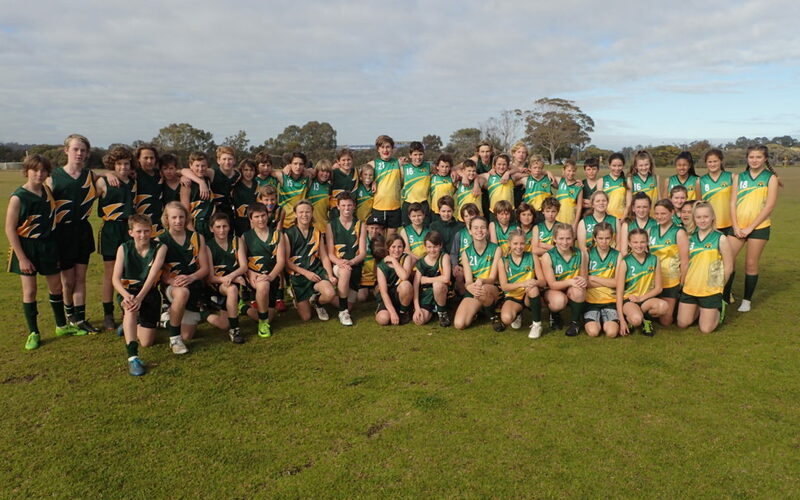 We had our largest team number ever to attend the event including AFL Boys (2 teams), AFL Girls (AFL Boys & Girls Squad photo attached), Basketball Boys, Basketball Girls, Mixed Hockey, Netball, Soccer Boys, Soccer Girls, Touch and Volleyball Girls, playing against other schools in the South West School Sport Association. Students committed regularly to training sessions that included sessions during lunchtimes and after school. I would like to congratulate all students in the 2018 Year 7 & 8 Lightning Carnival teams and hope to see all participants involved again in 2019. Included in our student group were student coaches, umpires and officials who provided valuable support to teams throughout the day. Special mention goes to our Parent Coaches, Maxine Williams (Mixed Hockey) and Andy Longmore (Soccer Girls), who invested their time into preparing and coaching their teams on the day. Also to our staff members; Bettina Pretsel, Berin Sluiter (AFL Boys), Sandy Roberts (AFL Girls), Zac Durkin (Basketball Boys), Amanda Gradisen (Basketball Girls), Brodi Read (Netball), Sue Buckland (Soccer Boys), John Andrews (Touch) and Stuart Kupfer-Hollis (Volleyball Girls); for their dedicated support and expertise.